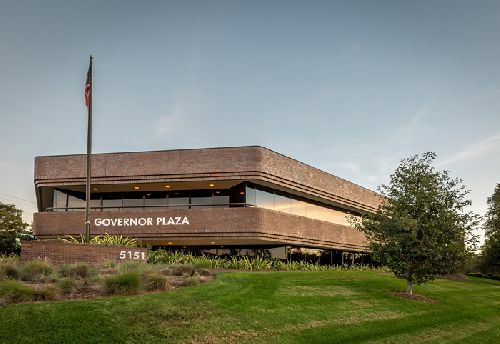 Governor Plaza, a 38.6k sf, multi-tenant office building in San Diego’s desirable Governor Park area, was purchased by a private investor for $10.825 mil ($280/sf). The two-story building sits on 2.4 acres at 5151 Shoreham Place, at the southwest quadrant of I-805 and Governor Dr. Situated within San Diego’s famed ‘Golden Triangle’, Governor Plaza was 100% leased at the time of sale to a highly diversified tenancy—consisting entirely of sub-5k sf users. It is close to surrounding business markets, residential communities and a wealth of dining, shopping, and entertainment choices. Originally developed in 1984, Governor Plaza underwent significant renovations in 2013 and feautres desirable business qualities such as outdoor seating and meeting areas in the courtyard, extensive window lines, flexible floor plates, tenant balconies, abundant natural light, resort-style restrooms, and shower facilities. The inviting courtyard at the building’s center also features a tranquil water feature, and beautiful, drought-tolerant Southern California landscaping. Additionally, the property offers recently renovated common areas and abundant parking. Rick Reeder and Brad Tecca with Cushman & Wakefield’s Capital Markets services in San Diego represented the seller, Shoreham Place LLC. Bill Cavanagh and Mike Novkov of the same C&W office also performed market advisory in the sale, and have also been retained by the buyer, Performance Wealth (HNW), to continue leasing services for the property.